Ok, I finally sat down and wrote it out. Enjoy! Use needles to match the size of your yarn. The gauge of the yarn I used was about 4.5 stitches per inch, but a thicker or thinner yarn could also be used. With double-point needles, slip 1st stitch on needle 1, 2nd stitch on needle 2, 3rd stitch on needle 1, etc. Odd stitches will be on needle 1 and even stitches on needle 2. With double-point needles, slip 1st stitch on needle 1, 2nd stitch on needle 2, 3rd stitch on needle 1, etc. as done previously. Odd stitches will be on needle 1 and even stitches on needle 2. And that's it! If you make a scarf using this pattern, please send me a photo. I'd love to see how it turns out. Thank you so much for posting the pattern! I'll let you know how it goes (I've never used double-pointed needles before)! Thanks for posting this pattern. I'm not much of a knitter but I admire that you are willing to share. You are a generous friend, I saw just how nice you are. Hi anonymous. Sorry I can't reply via email - no reply address wa supplied via blogspot, so I'll post a reply here. The yarn I used was about 25 st, 34 rows per 4" swatch (I always forget, but I think that's a Sport weight, right?) and called for a size 3 needle. But you should be able to use any size yarn, really. Good luck, and send me a photo when you're done. I'd love to see it! I love this scarf! I am a new knitter. How much experience do you need to knit this scarf? Thank you!!! 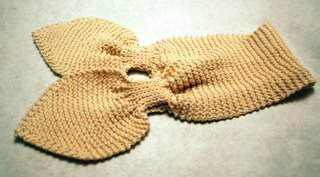 There is an adult version called the "Bow-Knot" or "Tuck-In" scarf. Many thanks for the great pattern! A fun knit that is perfect for the little ones. You can see the results (but not the best photo...) here. this scarf is amazing I love it thanks for the pattern! What are double pointed needles?can I just use normal needles? Thank you very much for offering the pattern for the baby bowtie scarf. It was a fast moving, fun scarf to knit. I made the scarf for my granddaughter in a beautiful pink, and it turned out lovely. I am certain I will use the pattern again and again. If you email me at sunlightttt@hotmail.com, I will send you a picture. New knitter...I'm wondering what the m1 stitch is...maybe I know as something else??? These are English instructions not continental right? Thanks so much!! Worked perfectly! I was able to use up some Koigu left over from some baby booties I made for my SIL. It's just starting to get chilly here in Oregon so the timing worked well. I plan to make some more for friends this Winter. Thank you for posting this pattern! I am a new knitter (this was my 3rd project) and fell in love with it! I knitted it for my 4 year old daughter. I am just so in love with her in it! Thank you so much!!! How many times I thought that people come out with the same idea independently! Bravo! I knitted this scarf before, using Drops pattern. Stuff like this is not really my thing but you've made it look so very nice. Then I will try to learn to do it. Thanks a lot for inspiring me! When making a M1 stitch, does it matter if it is a right or left stitch? My Nana used to have a scarf she made that looked just like this one. She called it a keyhole scarf. I like the one on ravelry where the ends are two different colors. Thanks for the pattern, it is easy but great! Thank you for posting his pattern. I was taught how to knit this baby scarf when I was a teen (taught by my aunt) and over the years I forgot the specifics.. Now I can make this again. It's a great baby scarf, because of the built in tie!!! I made a little change to the pattern but just loved it! Thank you so much for posting it I wish I knew how to place a photo it really came out cute. Thank you so much sharing I just finished the scarf it is so cute!!! !